The new Perth AHG facility. 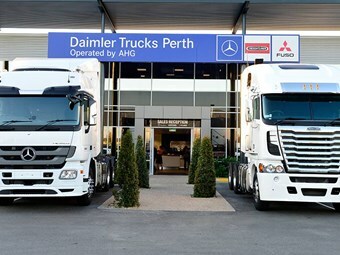 Automotive Holdings Group’s (AHG) partnership with Daimler Trucks appears destined only to strengthen following the official opening of the pair’s massive new Perth dealership near the airport at Hazelmere. That was the message from senior staff from both firms at a customers’ function a month after dealers, office staff and mechanics moved into a facility double the size of the former dealership on Kewdale Road in Welshpool. "It’s a stand-out location and a very impressive facility," AHG managing director Bronte Howson says. "It is an investment we are comfortable to make as we have great faith in the dealership team and every confidence in the Daimler brands." The new dealership holds franchises for the Mercedes-Benz, Freightliner and Fuso ranges and for Mercedes-Benz vans and Howson is bullish about its potential to grow further. "We’re filling it up pretty quick but that’s a good problem to have," he tells TradeTrucks, and is clearly pleased at what it offers customers by way of service and comfort. 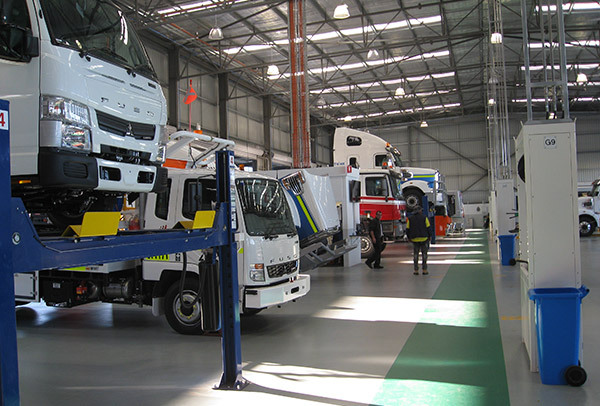 Daimler Trucks Perth dealer principal Simon Ramsay describes it as one of the biggest such facilities in the country and AHG is keen to point out its strategic location for the city’s commercial-vehicle friendly arterials. Joining AHG Daimler dealerships in Newcastle, Brisbane and the Gold Coast and with a footprint of more than 42,000 square-metres, the facility has two workshops covering 7,000sqm boasting 54 bays. It also has 315 truck parking bays and 30 customer bays. Its parts department extends across 1,200sqm over two levels and the workshops feature overhead gantry cranes, plus brake testing and roller shaker equipment. At customers’ behest, the site features pits and wash-bays that can handle B-triple combinations. 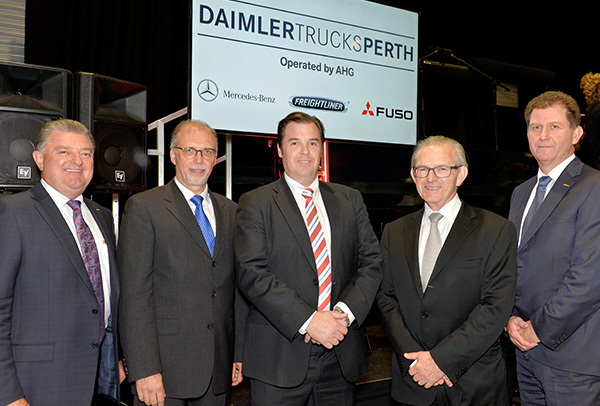 From left, AHG managing director Bronte Howson, DTNA international sales and service director Claus P Roth, Daimler Truck and Bus Australia managing director Daniel Whitehead, AHG chairman David Griffiths and Daimler Trucks Perth dealer principal Simon Ramsay. AHG chairman David Griffiths disclosed that, when all costs were totalled, the facility represents a $30 million initiative by his company. "This is a major commitment by AHG, it is a major demonstration of the faith we have in the Daimler brand, it’s a major demonstration of the faith we have in the people that run the trucking business," Griffiths says. Howson says the impetus for the style of dealership was predicated on lifting the customer experience to that of AHG’s car salesrooms. He reassured attendees that recent soft market conditions in heavy trucks had no bearing on the industry’s "required business" stature in his firm. Daimler Trucks North America (DTNA) international sales and service director Claus P Roth, presently based in South Carolina, was on hand for the event and gave the place high praise. "This is a facility that in comparison to other facilities around the world, even Daimler-owned branches and so on, is absolutely world-class," Roth says. He describes it as a "statement" to the market and Daimler and therefore an "obligation" for the truck maker, both locally and in North America. His thoughts were echoed by Daimler Truck and Bus Australia managing director Daniel Whitehead, whose company was involved closely in the facility’s planning and who averred that it did not bear comparison with others locally. "We are extremely proud of the relationship we have with AHG and we plan on making it bigger and better as time progresses," Whitehead says. 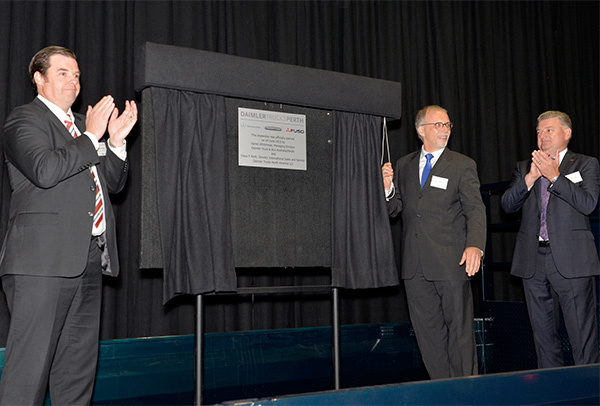 DTNA’s Claus P Roth reveals the commemorative plaque as AHG’s Bronte Howson, right, and Daimler Truck and Bus Australia’s Daniel Whitehead look on. The relocation was forced by a surge in business in recent years. As an indication of the need, Ramsay says the expanded spare parts section now holds $3.9 million worth of stock, including new engines, compared with the $1.8 million the previous facility held three years ago. At the event, Ramsay praised the commitment of staff during the move, noting that the business closed at noon on a Friday and opened again at 7:30am the following Monday and that in the intervening 67 hours "we moved more than 300 trucks and 85,000 individual parts". 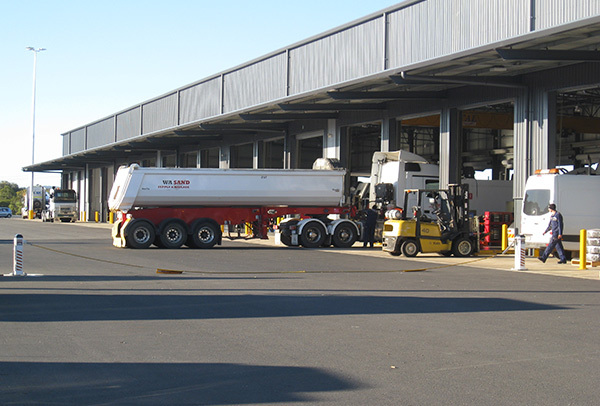 The facility also boasts two parallel pits capable of handling road trains — as can the truck wash — and with a walkway in between. A safety function renders the pits inoperable until exhaust fans have sucked out fumes. AHG as a group places great store on harnessing accurate data at all levels and the company holds attention to financial detail across truck and car facilities as crucial to its relentless growth. It means head office managers have immense clarity on the performance of every sales and service facility and the ability to drill down to any level and rate of expenditure, while matching performance against budgets and key performance indicators at any given moment in the cycle. The state-of-the-art facility features a Levanta motor liquids dispensing system plumbed through the workshop floors that measures all amounts used per job. Like the scheduling software system that tracks the performance of each repair and/or maintenance job, it is part of a forensic approach AHG has towards performance management, inventory and expenditure. Despite the scrutiny, Ramsay says he has great autonomy in operational matters, though this may also be a function of the 17 years he has been with the company. Getting vehicles to Perth is a multimodal affair. Lighter Daimler vehicles, such as Fuso and Mercedes-Benz vans are either shipped to Fremantle or driven to Adelaide and railed. Prime movers and heavy rigids are driven from the eastern states, predominantly from Victoria. The green walkway holds the pipes to the dispensing machines. AHG says its history with Daimler goes back many years when the Skipper Trucks dealership in Belmont originally sold the Fuso range when the brand was built under the original Mitsubishi ownership. A series of transactions between 2001 and 2006 saw control of the Fuso brand pass to Daimler Motors. In 2011, AHG purchased Diesel Motors Trucks, which was selling Daimler’s Mercedes-Benz and Freightliner brands in Kewdale Road at Welshpool. The Skipper Trucks Fuso franchise was transferred to that dealership, which was renamed Daimler Trucks Perth. 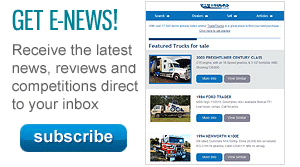 During the following 12 months, AHG also acquired Daimler Trucks dealerships in Newcastle, Gold Coast and Brisbane. Dealer principal Ramsay says the new facility had won praise from customers and staff alike. "The team members here are really enjoying the new facilities and they understand the increased range of services and benefits we can offer our customers," Ramsay says. "The scale of the dealership and the location speak for themselves." A WA Sand semi at the western workshop. Now that he has moved and settled, Ramsay sees that finding the right staff can be challenging task, even though the easing of the mining and resources boom means more people are in the market for jobs. "We’ve got 330 job cards open today," he tells TradeTrucks before the event. But he is adamant they have to be the right people and that such people do become available. "There are always good guys coming back," he says, but adds that the mining slowdown is a mixed blessing, with salary expectations, among younger candidates especially, unrealistic. Better-paid current staff tends to be those who stuck with the company and resisted the call of the mines. Some of those got their opportunity through work visas and AHG sponsorship. 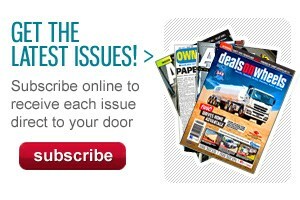 The dealership has an average wait of 17 days to fill vacancies with only three positions lasting more than 90 days. 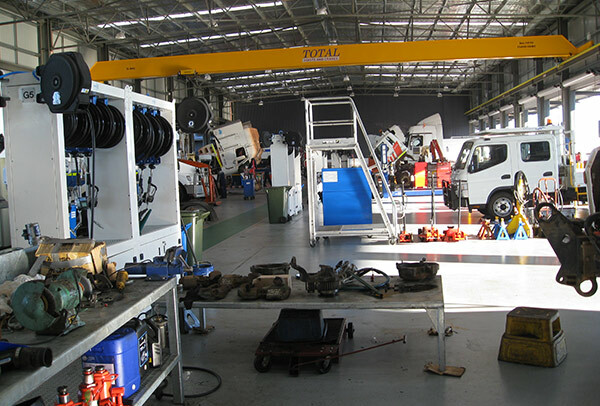 A Total workshop gantry crane.